With the worst of the wind from storm Gareth behind us, it didn't turn out to be too bad a day at Grosmont yesterday - quite warm in the sun out of the wind. With Peter Whitaker, Bill Dobson, Ian McCall, Nigel Hall, Ian Pearson, Nigel Bill and myself. The stove was cleaned out and lit by Ian P and then kettle on for our usual cuppa. First job for the two Ians was to comple last Saturday's work on the J27 by tightening the bolts on the water valve flange. To do this the bracket bolts had to be removed to enable the valve to drop sufficiently to gain access to the inner nut and bolt on the water valve. With this achieved, all the bolts then tightened up and the bracket bolted back onto the frames, the job was complete. Ian M then set about securing the water valve handle in the cab which he did with some shims and secured with a split pin. Today the J27 and S160 are due to be swapped over, putting the S160 onto No7 Road to allow for painting and fitting components onto the left side of the locomotive, whilst the J27 stands on No 8 Road waiting for its start of work at the end of the month on services in conjunction with the visit by A4 No 60009 Union of South Africa. Meanwhile, Bill and I were involved in removing the Q6 tender brake linkages for NDT testing. The left hand side was removed first, which strangely enough is stamped right. So it was no surprise to find the right hand side stamped left when that was removed! Both these rod have adjusting buckles which were taken apart and cleaned. Peter Whitaker was fully employed setting up masking tape and painting tender letters and numbers. Lunch as usual was had round the stove. After lunch I painted with black primer all the brake rods that had been NDT tested and fitted back on the engine, then opened up all the split pins on the brake pins. 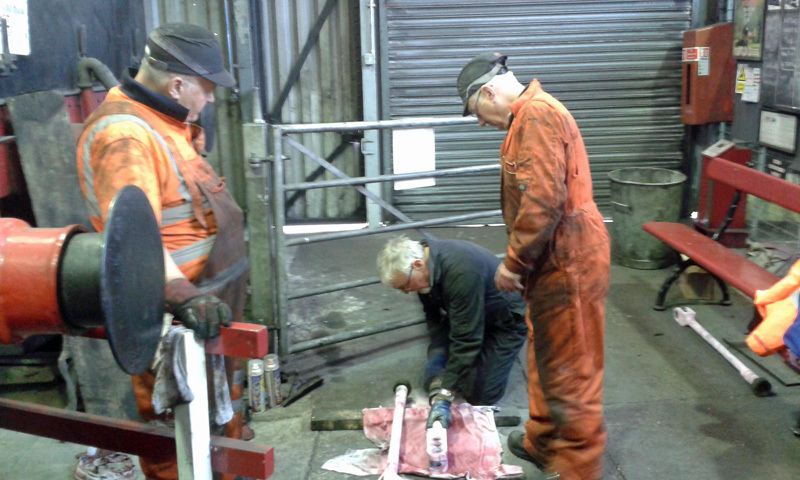 Everyone else was fully employed (see photo), cleaning the tender brake rods ready for NDT testing. The cleaning was done in various ways - scraping, wire brushing, and burning the old paint off with the oxy gear. Both sets of rods were NDT tested and no cracks found , but what was found was some wear on the right hand rod about a foot above the threaded end. This was shown to Paul Middleton who will inform John Graham and get Mark O' Brien to weld it up. This rod has been put under the seat at the north end of Deviation Shed waiting to be welded. Bill measured the thickness of the cylinder liner which was found to have plenty of metal left for boring out next winter. He also received his PTFE gasket material which is to be used as a sealing ring for the right cylinder cover. I did the monthly check on the defibrillator, and delivered to the workshop a box of hi vis vests for Bryan Orange and the JVs.